Many Canadian places and regions have a historical significance which can be traced back to the fur trade and the Métis Nation. Geography also exerted its influence on how fur trade operations were built. Hand-made model of a snowshoe constructed according to a “beaver tail” pattern. Snowshoes were made by constructing a wooden frame and "netting" webbing using babiche or narrow strips of rawhide. Blue, red and yellow woolen strips of cloth (twill tape) were used to decorate the ends of the snowshoes. Geometric designs, including a bird-track (possibly ptarmigan) motif, have been painted on the webbing with natural pigments. Learn more about transportation - type 'transportation' into the search box to your left. Check the Beaver Index - e.g., type in 'snowshoes,' 'transportation,' 'Inuit,' 'aboriginal,' etc. Travel by foot in winter would not be possible without snowshoes and their use was quickly adopted by European traders. Each First Nations group had its own particular way of making snowshoes. 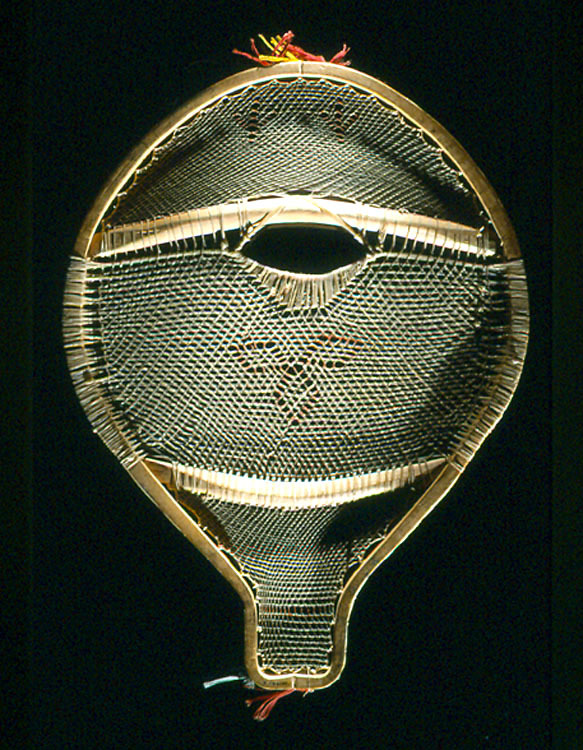 The Innu (Montagnais or Naskapi of Quebec) used a needle of bone, horn or iron for netting the babiche webbing. The snowshoe was secured to the foot using a wide piece of hide thong attached at the semicircular opening just at the back of the toe bar. “Beaver tail” snowshoes were worn mainly by men. They were used during mid-winter when the snowfall tended to be light and powdery. The "bear paw" style was used with the first snow, and the "swallow tail" type was favoured during November and December and again in March and April when the snow was heavy and granular. The pointed-toe snowshoe was used on well-travelled trails in the forests.